栾桂杰, 殷鹏, 王黎君, 由金玲, 周脉耕. Luan Guijie, Yin Peng, Wang Lijun, You Jinling, Zhou Maigeng. Luan Guijie, Yin Peng, Wang Lijun, You Jinling, Zhou Maigeng. Association between high air temperature and mortality in summer: A multi-city analysis in China[J]. Chinese Journal of Epidemiology, 2019, 40(1): 59-63. 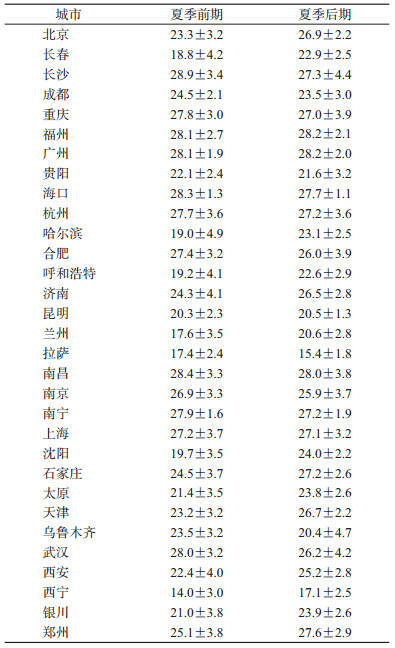 Abstract: Objective To understand the associations between changes of high air temperature and mortality in summer in 31 cities in China. 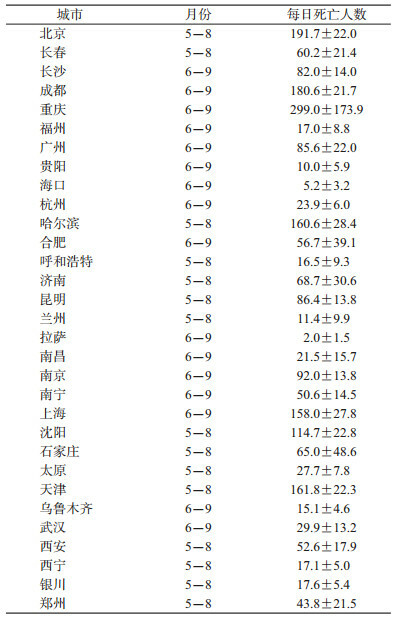 Methods Daily mortality and meteorological data in 31 cities in China from January 1, 2008 to December 31, 2013 were collected. Distributed lag nonlinear model was used to evaluate the association between high air temperature change and mortality in early summer and late summer after controlling for the long-term trend and the effect of "day of week". Results The relative risk of high air temperature on mortality was higher in early summer, with relative risk in the range of 1.08-2.14 in early summer and 1.03-1.67 in late summer. In early summer, the influence of high temperature on mortality was mainly below 5th of percentile and above 50th of percentile, while in late summer it was mainly above 95th of percentile. The lag effect of high air temperature on mortality in early summer was 6 days, while the lag effect in late summer was only about 2 days. Conclusions Association existed between high air temperature and mortality. The influence of high air temperature on mortality in early summer was stronger than that in late summer. It is necessary to take targeted protection measures. 刘玲, 张金良. 气温热浪与居民心脑血管疾病死亡关系的病例交叉研究[J]. 中华流行病学杂志, 2010, 31(2): 179-184. 栾桂杰, 李湉湉, 殷鹏, 等. 2010年北京市高温热浪对居民死亡的影响[J]. 环境卫生学杂志, 2015, 5(6): 525-529. 张云权, 宇传华, 鲍俊哲. 平均气温、寒潮和热浪对湖北省居民脑卒中死亡的影响[J]. 中华流行病学杂志, 2017, 38(4): 508-513. 栾桂杰, 殷鹏, 王黎君, 等. 我国6城市高温对糖尿病死亡影响的观察性研究[J]. 中华流行病学杂志, 2018, 39(5): 646-650.